While campaigning in 2007 for the presidency, Barack Obama spoke at a ceremony commemorating the forty-second anniversary of the march from Selma to Montgomery. Obama told his audience, It is because they marched that I stand here before you today. In, Because they Marched: the people’s campaign for voting rights that changed America, nonfiction writer extraordinaire, Russell Freedman documents events that led up to that historic march to Montgomery, Alabama and how the U.S. Congress, including Southern lawmakers, would then approve the Voting Rights Act of 1965. Senator Harry Byrd of Virginia said, We can’t deny the Negroes a basic constitutional right to vote. Though the protesters practiced nonviolence, local and state law officials met them with acts of violence. 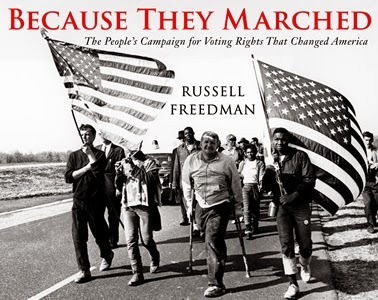 Impeccably researched and packed with historic black & white photographs, Because they Marched helps us remember the courage of the Civil Rights activists who risked their lives to ensure all U.S. citizens, especially minorities or the poor, have the right to vote. The right to vote continues to be challenged and the meaning of American democracy remains a topic of debate and struggle. It will be in the news as we near another presidential election in 2016, because key provisions of the Voting Rights Act of 1965, was not upheld by the Supreme Court in 2013. The controversial 5-4 decision in Shelby County v. Holder released nine states, mostly in the South, from the requirement that they must seek advance federal approval before making any change in their election laws. Now states can make it harder for minority voters, older people, students, legal immigrants, and the poor of all races to register and vote.